It’s hard to ignore the looming EV vehicle showdown between the Chevy Volt and the Nissan Leaf even though the vehicles are totally different in nature and target market. While the Nissan Leaf is simply a beautifully-packaged electric vehicle with around a 100 mile range, the Chevy Volt takes a different approach by having a somewhat limited 40 mile EV range but an on-board gas-powered generator that will power the electric motor as long as there’s gas in the tank. 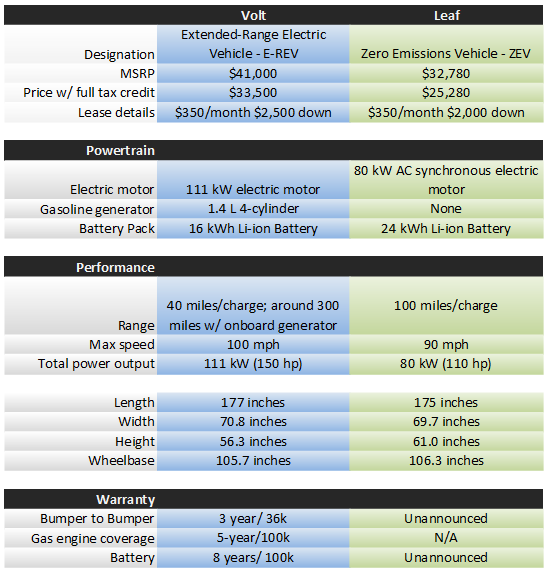 GM is clearly targeting the a higher-end market with a $41,000 MSRP while the Nissan Leaf is a bit more down-market with a starting price of $32,000. That’s fine. There’s more than enough room in the world for both of the vehicles. There doesn’t really have to be a winner here. In terms of sales numbers, the Nissan Leaf will enter more markets than the Volt (or its Opel Ampera counterpart) initially anyway. GM only expects to sell about 10,000 Volts during the first year where Nissan already 17,000 Leaf pre-orders, 5,000 more than the first year estimate. Clearly both vehicles are highly anticipated, though, so comparisons will no doubt be made around workplace watercoolers from now on. Here’s what we know so far. Both GM and Nissan have strategically been rolling out details about their respective vehicles. Performance data still hasn’t been released for either. The gas tank size of Volt is unknown and Nissan hasn’t announced warranty info just yet. Clearly we don’t have all the info just yet, but there’s more than enough firepower to start a little flame war with your coworkers.